Bu araştırmanın amacı kendini sabotaj ile onay, kişilerarası ilişkiler ve benlik ile ilişkili akıldışı inançlar ve genel akıldışı inanç düzeyleri arasındaki ilişkileri”ABC”çerçevesi kapsamında incelemektir. Araştırma grubu 263 öğretmen adayından oluşmaktadır. Yapıları ölçmek için Kendini Sabotaj Ölçeği ve Akıldışı İnançlar Ölçeği-Kısa Formu kullanılmıştır. Spearman Rho Korelasyon ve Mann Whitney U analizleri kullanılmıştır. Onay ile ilişkili akıldışı inançlar ve genel akıldışı inanç düzeyinin kendini sabotaj ile anlamı düzeyde ilişkili bulunmuştur (sırasıyla r= .33 ve r= .18, p< .05). Sonuçlar onay ile ilişkili akıldışı inançlar ile kendini sabotaj arasında pozitif yönde bir ilişki olduğunu göstermektedir. Onay ile ilişkili akıldışı inançlar açısından cinsiyete göre anlamlı bir farklılık bulunmuştur. Sonuçlar ilgili alan yazın kapsamında tartışılmıştır. The main objective of the current study is to examine the relationships between selfhandicapping, and irrational beliefs about approval, irrational beliefs about interpersonal relationships, irrational beliefs about self and the overall level of irrational beliefs by reference to the “ABC” framework. Participants of the study were 263 teacher candidates. SelfHandicapping Scale and Irrational Beliefs Scale-Short Form was utilized in order to measure the constructs. Spearman’s Rho correlations and Mann-Whitney U analyses were conducted. Irrational beliefs about approval and general irrational beliefs levels significantly related with levels of self-handicapping (r= .33 and r= .18 respectively, p< .05). The results verified that self-handicapping scores related positively to the scores of irrational beliefs about approval. A gender difference with respect to levels of irrational beliefs about approval was also verified. The results were discussed within the scope of the related literature. self-handicapping, irrational beliefs, approval, teacher candidates. Akın, A. (2010). The effect of Rational Emotive Behavioral Therapy based group counseling to the psychological well-being and self-compassion. Unpublished Doctoral Dissertation, Sakarya University. Akın, A. (2012). Self-handicapping Scale: A study of validity and reliability. Education and Science, 37(164), 176-187. Arazzini-Stewart, M., De George-Walker, L. (2014) .Self-handicapping, perfectionism, locus of control and self-efficacy: A path model. Personality and Individual Differences, 66,160-164. Blau, S., Fuller, J. R., & Vaccaro, T. P. (2006). Rational-emotive disputing and the five-factor model: Personality dimensions of the Ellis emotional efficiency inventory. Journal of Ra-tional-Emotive & Cognitive Behavior Therapy, 24, 87-100. Chodorow, N. J. (1989). Feminism and psychoanalytic theory. New Haven, CT: Yale Univer-sity Press. Corey, G. (2008). 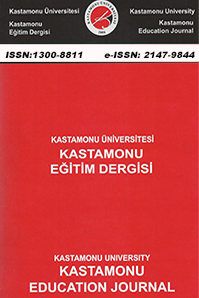 Psikolojik danışma, psikoterapi kuram ve uygulamaları [Theory and Prac-tice of Counseling and Psychotherapy]. (Trans. Tuncay Ergene). Ankara: Mentis Yayıncılık. Cosman, I, Macavei, B., Sucala, M., & David, D. (2013). Rational and irrational beliefs and coping strategies among Transylvanian holocaust survivors: An exploratory analysis. Journal of Loss and Trauma, 18,179-194. David, D., Szentagotai, A., Eva, K., & Macavei, B. (2005). A synopsis of rational-emotive behavior therapy (REBT): Fundamental and applied research. Journal of Rational-Emotive & Cognitive-Behavior Therapy, 23(3), 175-221. David, O. A, Matu, S. A., Pintea, S., Cotet, C. D., & Nagy, D. (2014). Cognitive-behavioral processes based on using the ABC analysis by trainees’ for their personal development. Journal of Rational-Emotive & Cognitive-Behavior Therapy, 32(3), 198-215. doi 10.1007/s10942-014-0189-0. DeGree, C. E., Snyder C. R. (1985). Adler's psychology (of use) today: personal history of traumatic life events as a self-handicapping strategy. Journal of Personality Social Psychology, 48(6), 1512-1519. Dryden, W. (2012). The ‘‘ABCs’’ of REBT I: A preliminary study of errors and confusions in counselling and psychotherapy textbooks. Journal of Rational-Emotive & Cognitive-Behavior Therapy, 30, 133-172. Dryden, W. (Ed.). (2003). Rational Emotive Behaviour Therapy: Theoretical Developments. Brunner-Routledge, UK. Ellis, A & Dryden, W. (2007). The practice of rational-emotive therapy (2nd ed.). New York: Springer. Ellis, A. (1991). The revised ABC's of rational-emotive therapy (RET). Journal of Rational-Emotive and Cognitive-Behavior Therapy, 9(3), 139-172. Ellis, A. (1994). Reason and emotion in psychotherapy, NY: Birch Lane Press. Ellis, A. (2008). How to make yourself happy and remarkably less disturbable (7th ed.). California: Impact Publishers. Ellis, E. & Harper, R. A. (2005). Akılcı Yaşam Kılavuzu. (3. Baskı) [A Guide To Rational Living (3rd edition)]. Kunt, S. K. (Trans. ), Hyb Yayıncılık, Ankara. Feick, D. L., & Rhodewalt, F. (1997). The double-edged sword of self-handicapping: Dis-counting, augmentation, and the protection and enhancement of selfesteem. Motivation and Emotion, 21, 147-163. Frost, R. O., Marten, P., Lahart, C., & Rosenblate, R. (1990). The dimensions of perfectionism. Cognitive Therapy and Research, 14, 449-468. Harrington, N. (2013). Irrational beliefs and socio-political extremism. Journal of Rational-Emotive & Cognitive-Behavior Therapy, 31, 167-178. Higgins, R. L., & Harris, R. N. (1988). Strategic ‘‘alcohol’’ use: Drinking to selfhandicap. Journal of Social and Clinical Psychology, 6, 191-202. Hirt, E. R., McCrea, S. M. & Boris, H. I. (2003). “I Know You Self-Handicapped Last Exam”: Gender Differences in Reactions to Self-Handicapping. Journal of Personality and Social Psychology, 84(1), 177-193. Hvland, P., Shevlin, M., & Adamson, G. (2014). The moderating role of rational beliefs in the relationship between irrational beliefs and posttraumatic stress symptomology. Behavioural and Cognitive Psychotherapy, 42, 312-326. Jones, E. E., & Berglas, S. (1978). Control of attributions about the self through self-handicapping strategies: The appeal of alcohol and the role of underachievement. Personality and Social Psychology Bulletin, 4, 200-206. Jones, E. E., & Rhodewalt, F. (1982). The self-handicapping scale. Princeton, NJ: Princeton University Press. Kearns, H., Forbes, A., Gardiner, M., & Marshall, K. (2008). When a High Distinction isn’t Good Enough: A Review of Perfectionism and Self-Handicapping, The Australian Educa-tional Researcher, 35(3), 21-36. Kiyotaki, Y., & Yokoyama, K. (2006). Relationships of eating disturbances to alexithymia, need for social approval, and gender identity among Japanese female undergraduate students. Personality and Individual Differences, 41,609-618. Kolditz, T. A., & Arkin, R. M. (1982). An impression management interpretation of the self-handicapping strategy. Journal of Personality and Social Psychology, 43(3), 492-502. Maatta, S., Stattin, H., & Nurmi, J. E. (2002). Achievement strategies at school: Types and correlates. Journal of Adolescence, 25, 31-46. Martin, K. A., & Brawley, L. R. (2002). Self-esteem, self-efficacy, and selfhandicapping: The relationship between stable and situational forms of self-doubt and self-handicapping in physical achievement settings. Self and Identity, 1, 337-351. McCrea, S. M. & Hirt, E. R. (2001). The Role of Ability Judgments in Self-Handicapping. Personality and Social Psychology Bulletin, 27(10), 1378-1389. Petersen, L. (2014). Self-compassion and self-protection strategies: The impact of self-compassion on the use of self-handicapping and sandbagging. Personality and Individual Differences, 56,133-138. Rhodewalt, F., & Fairfield, M. L. (1991). Claimed self-handicapping and the selfhandicapper: The relation of reduction in intended effort to performance. Journal of Research in Psychol-ogy, 25, 402-407. Rhodewalt, F., Saltzman, A. T., & Wittmer, J. (1984). Self-handicapping among competitive athletes: The role of self-esteem protection. Basic and Applied Social Psychology, 5, 197-209. Schwinger, M. (2013). Structure of academic self-handicapping: Global or domain-specific construct? Learning and Individual Differences, 27, 134-143. Smith, T. W., Snyder, C. R., & Perkins, S. C. (1983). The self-serving function of hypochon-driacal complaints: Physical symptoms as self-handicapping strategies. Journal of Personality and Social Psychology, 44(4), 787-797. Snyder, C. R., Smith, T. W., Augelli, R. W., & Ingram, R. E. (1985). On the self-serving function of social anxiety: Shyness as a self-handicapping strategy. Journal of Personality and Social Psychology, 48(4), 970-980. Strube, M. J. (1986). An analysis of the Self-Handicapping Scale. Basic Applied Social Psy-chology, 7(3), 211-224. Takash, H., Ghaith, S., & Hammouri, H. (2013). Irrational beliefs about family violence: A pilot study within Jordanian university students. Journal of Family Violence, 28, 595-601. Takeuchi, H., Taki, Y., Nouchi, R., Hashizume, H., Sekiguchi, A., Kotozaki, Y., Nakagawa, S., et al. (2013). Anatomical correlates of self-handicapping tendency. Cortex, 49, 1148-1154. Tanhan, F. (2014). An analysis of factors affecting teachers’ irrational beliefs. Educational Sciences: Theory & Practice, 14(2), 9-14. Türküm, S. (2003). The development of irrational belief scale and studies of minimizing the number of items. Turkish Psychological Counseling and Guidance Journal, 2(19), 41-47. Warner, S., & Moore, S. (2004). Excuses, excuses: Self-handicapping in an Australian ado-lescent sample. Journal of Youth and Adolescence, 33, 271-281. Zuckerman, M., & Tsai, F.-F. (2005). Costs of self-handicapping. Journal of Personality, 73, 411-442. ISNAD KAYA, Çınar , UĞUR, Erol , ŞAR, Ali Haydar , ERCENGİZ, Mustafa . "Öğretmen Adaylarında Kendini Sabotaj ve Onay İle İlişkili Akıldışı İnançlar". Kastamonu Eğitim Dergisi 25 / 3 (May 2017): 869-880.